Today, those who have been touched and influenced by the life of Rev. Jan Visser, commemorate his 8th year death anniversary. I met bro. Jan in 1991 when pastor Kimao and my brother brought me to Grace Mountain Mission for enrollment. Jan Visser was Dutch military officer and served in Indonesia during his military tenure. In 1979, he and his Indonesian friend came Sinipsip Bakun, Northern part of the Philippines as missionaries and founded Grace Mountain Academy (GMA), known today as Grace Mountain Mission (GMM). Sinipsip Bakun is located in a mountain ridge at over 7000 feet above sea-level. At GMM, the student called Jan, Brother Jan or Pak Jan. Brother Jan was a great source of encouragement and motivation to many. He had inspired and impacted many lives in the Igorot world. Thankfully, I am one of those individuals that have been greatly impacted by the life of this man. Bishop Jan Visser was never married and he remained celibate the rest of his life. When he died, he was buried at the GMM campus. As a matter of fact, the bishop had his tomb built while still alive. Although Brother Jan does not have a theological training, he had been a missionary for over 10 years and more than qualified when he was recommended for church ordination in the early 90s. For some reasons, the Skyline Luzon District (SKLD) Conference of The Wesleyan Church didn't perform the rites of ordination. Nevertheless, Bishop Alfonso G. Pablo Sr., then the General Superintendent of the Wesleyan Church of the Philippines later had bestowed Jan Visser the title Reverend with all the rights and privileges of being an ordained minister. Doctor Pablo's letter of ordination was read during a chapel service at GMM to which I was present. In the mid part of the 90s, Bishops and leaders of the Filipino Communion of Evangelical Episcopal Churches (FCEEC) officially ordained the Rev. 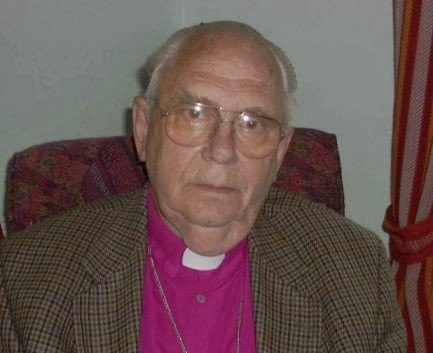 Jan Visser and was also elevated in the ranks of Archbishop. During my stay at Grace Mountain Mission, Bro. Jan challenged and motivated us incessantly not only spiritually but academically. “You will never see the world unless you earn how to speak English,” his voice would thunder throughout the chapel room during our morning or evening services. Many of the students seemed convinced, but others were skeptic. At other times, he would say, “The language of the world is English. Learn and speak it properly.” Then one day, he told us that he started to learn English when he was twenty-seven years old. Back then, I didn't know he had to learn the English language as well. You see, most of us in the mountain thought that all white-skinned people are Americans, and therefore they speak English as first language. Brother Jan also spoke about language immersion if we are to speak English with fluency. After, setting my foot at the seminary years later, and then to Cambodia, I realized that brother Jan was right about his stance on the English language. 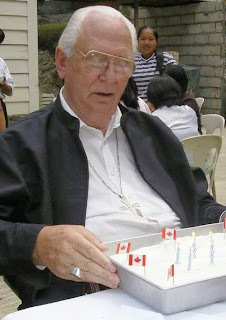 On September 15, 2005 Archbishop Jan Visser died while being attended at Saint Luis Hospital in Baguio. He was laid to rest in a tomb at the GMM campus on September 21, which happens to be my 34th birthday. Brother Jan's love for the Igorot Children is exemplified in his determination to see the children succeed in life. I was not able to attend the funeral as I had just returned to Cambodia in July that year. My family and I had fun visiting him in the earlier month of 2005. The school he founded in 1979 still exist today. Rev. Jose Milan continue to lead and supervise the school.